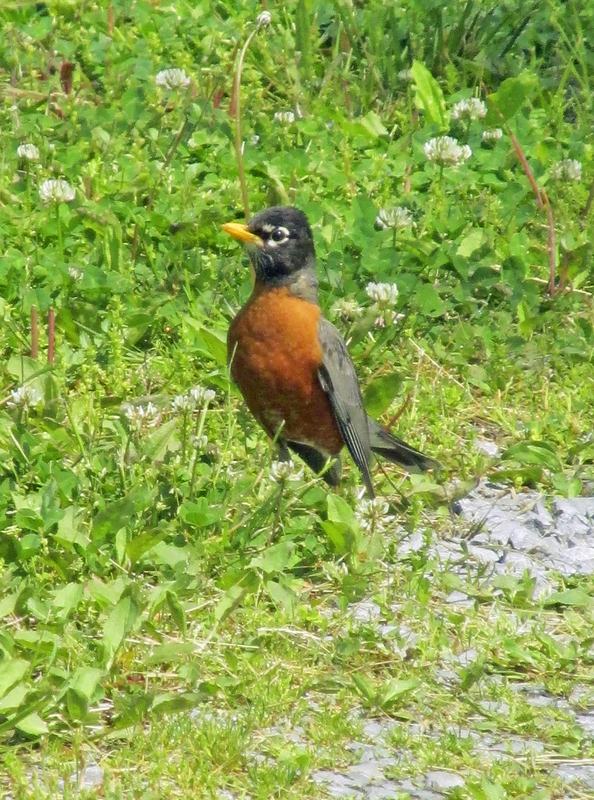 Photos by Bryan Stevens The American Robin, such as the individual pictured here, is a common breeding bird in the Northeast Tennessee counties of Carter and Unicoi. 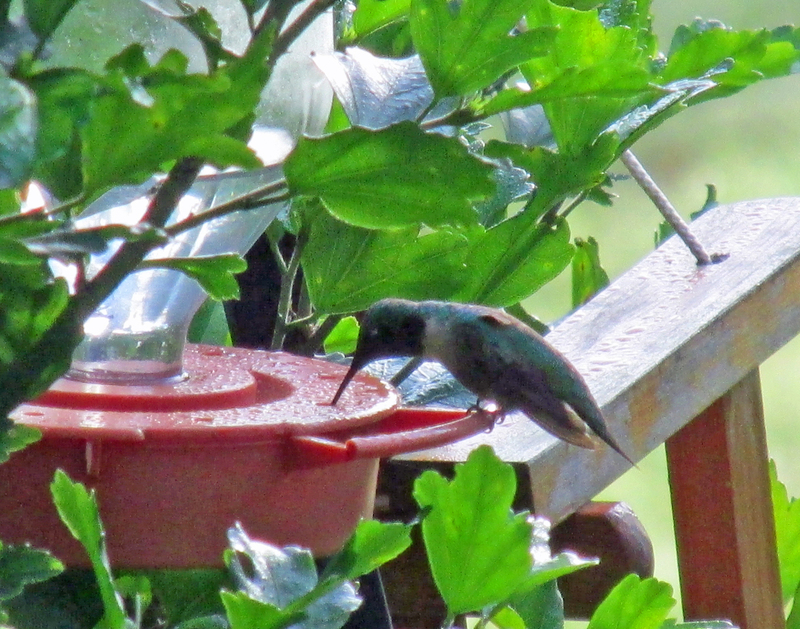 The Lee and Lois Herndon Chapter of Tennessee Ornithological Society, also known as the Elizabethton Bird Club, recently held two summer bird counts. Long-time compiler Rick Knight said that while additional counts in spring, fall and at Christmas provide data on seasonal bird populations, summer is the most important season for the majority of species. 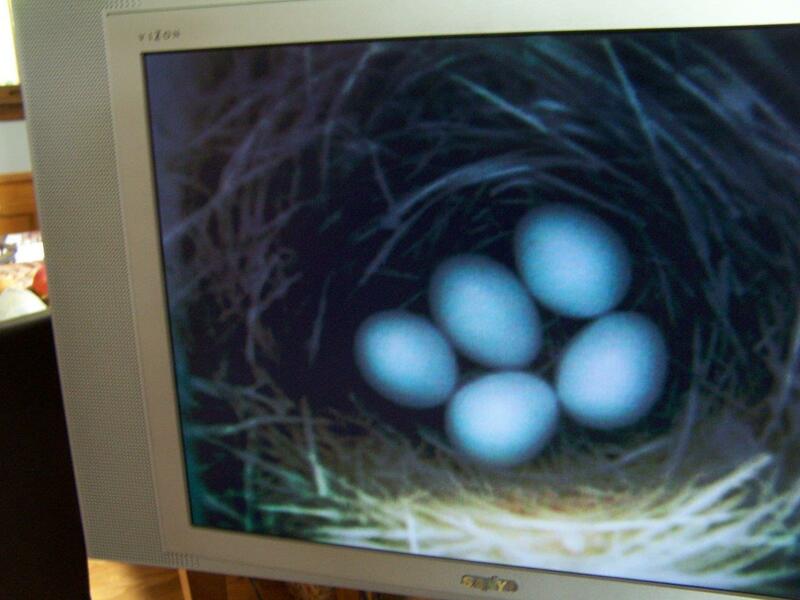 Knight noted that although Great Horned Owls have long since fledged and American Goldfinches likely have not begun nesting, most species are actively engaged in reproduction. Thus, chapter members conduct a summer count to supplement other monitoring activities. The Breeding Bird Atlas in Tennessee was run 1986-1991 and apparently won’t be repeated anytime soon. The Breeding Bird Survey is a localized survey that is very useful, but with biases (limited to roadsides, often misses some habitats). 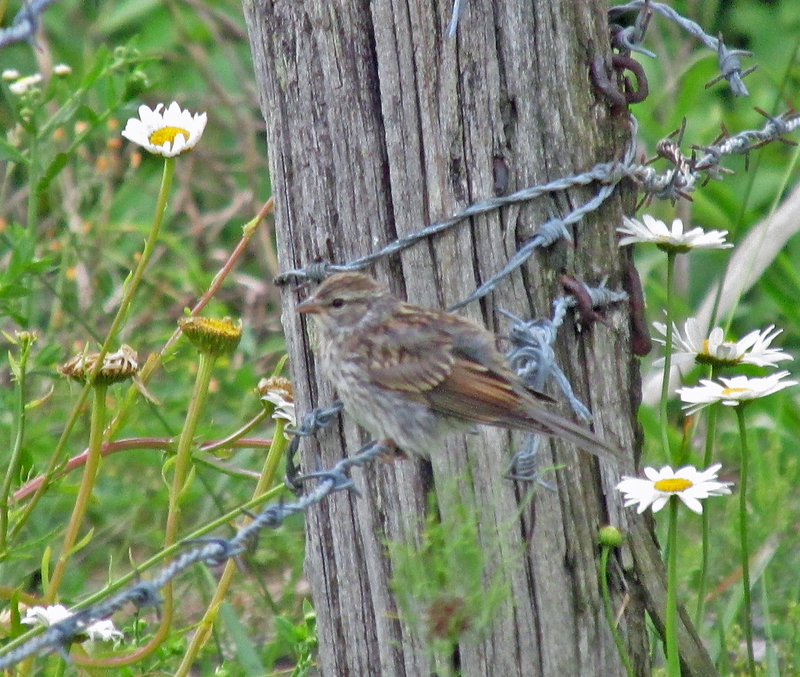 “Not knocking either, just supplementing them,” Knight said of the motivation for the club’s conducting of two summer bird counts. The 22nd annual Carter County summer count was held Saturday, June 13, with 16 observers in five parties. Participants found 116 species. This is slightly above the average of 113 species over the previous 21 years. Count totals during this span have ranged from 105 to 121 species. Highlights included a female Common Merganser, which has been lingering since spring. 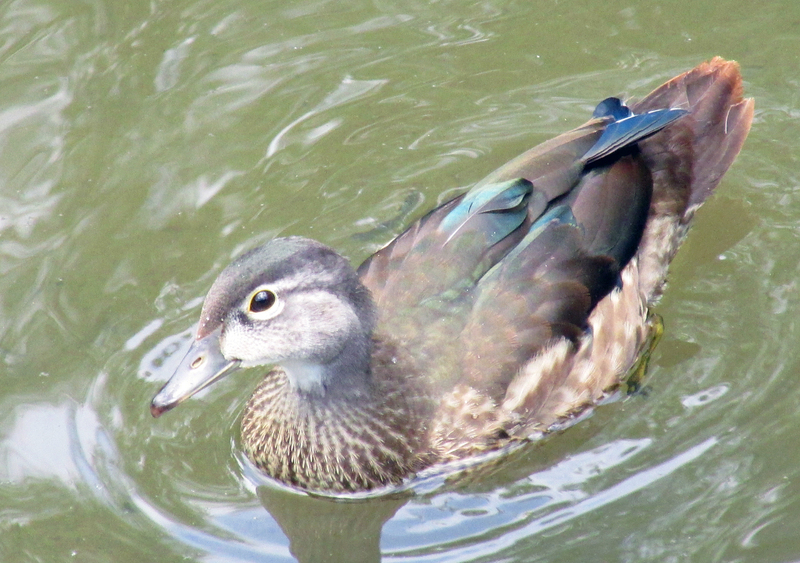 It’s also the first June record for this duck in Northeast Tennessee. 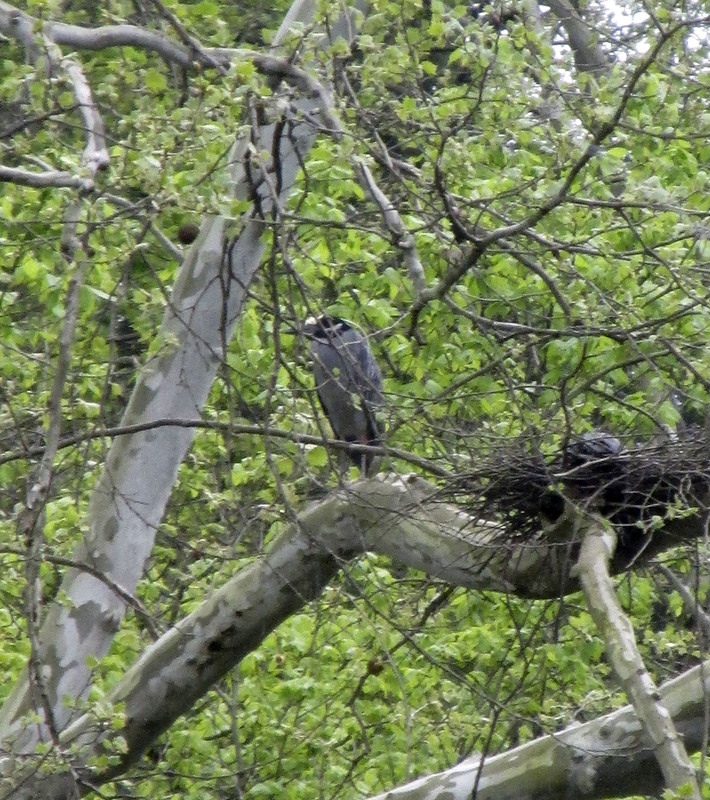 Yellow-crowned Night-Herons nest in small numbers along the Watauga River in Carter County. Other highlights include a non-breeding Common Loon and four Double-crested Cormorants near a new nesting site at Watauga Lake, as well as three Yellow-crowned Night-Herons, two Eurasian Collared-Doves and a single Yellow-bellied Sapsucker. Other outstanding finds included three Alder Flycatchers, two Least Flycatchers, a Warbling Vireo and 15 Common Ravens. 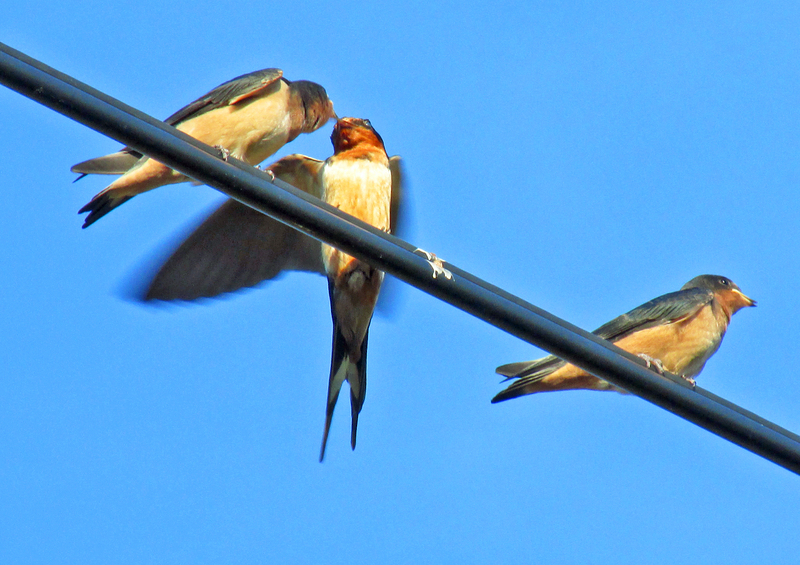 Cliff Swallow, with 317 individuals found, was the most numerous swallow and is rapidly increasing its summer nesting population. 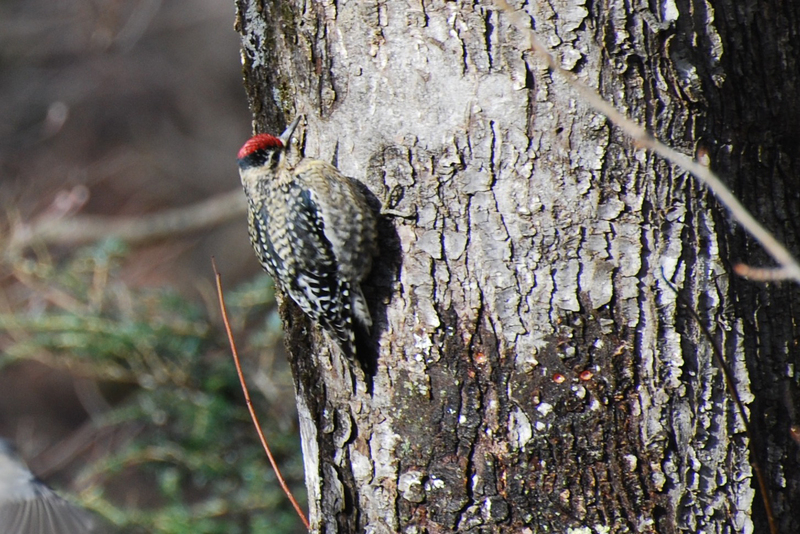 Other noteworthy finds, according to Knight, include 10 Red-breasted Nuthatches, three Brown Creepers, nine Winter Wrens, seven Golden-crowned Kinglets, four Hermit Thrushes and 21 species of warbler, as well as two Vesper Sparrows. Canada Goose, 268; Wood Duck, 5; Mallard, 101; Common Merganser, 1; Wild Turkey, 9; Common Loon, 1; Double-crested Cormorant, 4; Great Blue Heron, 28; Yellow-crowned Night-Heron, 3; and Green Heron, 6. Black Vulture, 2; Turkey Vulture, 31; Cooper’s Hawk, 2; Broad-winged Hawk, 6; Red-tailed Hawk, 6; American Kestrel, 1; Killdeer, 9; Rock Pigeon, 53; Eurasian Collared-Dove, 2; and Mourning Dove, 98. Yellow-billed Cuckoo, 1; Eastern Screech-Owl, 1; Great Horned Owl, 1; Barred Owl, 3; Common Nighthawk, 3; Chuck-will’s-widow, 1; Whip-poor-will, 14. 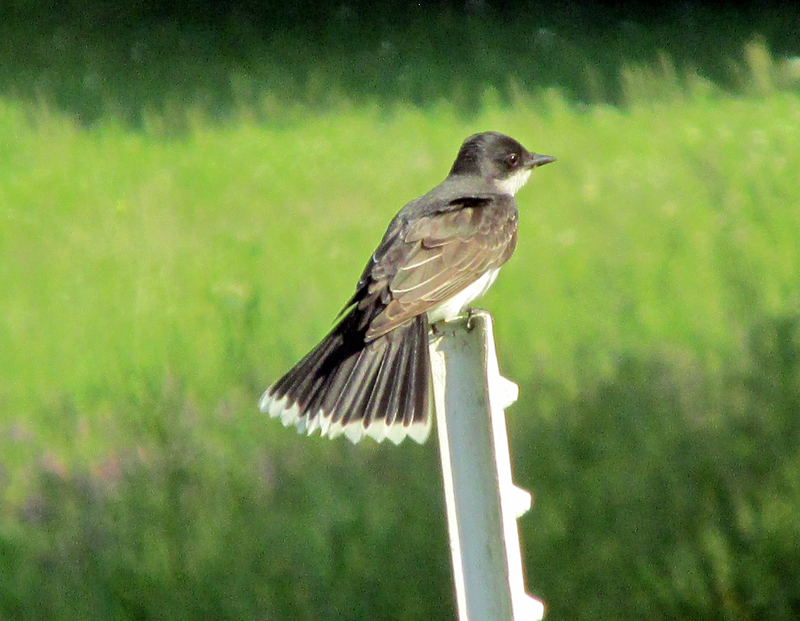 An Eastern Kingbird perches on a fence post. 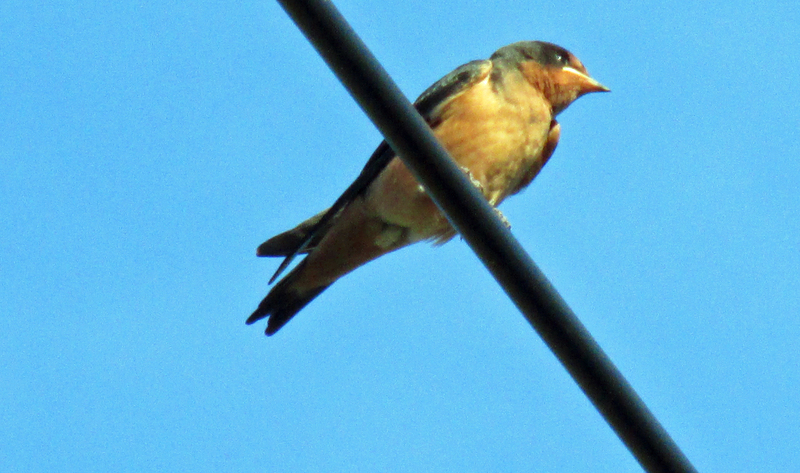 Chimney Swift, 85; Ruby-throated Hummingbird, 27; Belted Kingfisher, 10; Red-bellied Woodpecker, 18; Yellow-bellied Sapsucker, 1; Downy Woodpecker, 9; Hairy Woodpecker, 4; Northern Flicker, 8; and Pileated Woodpecker, 14. 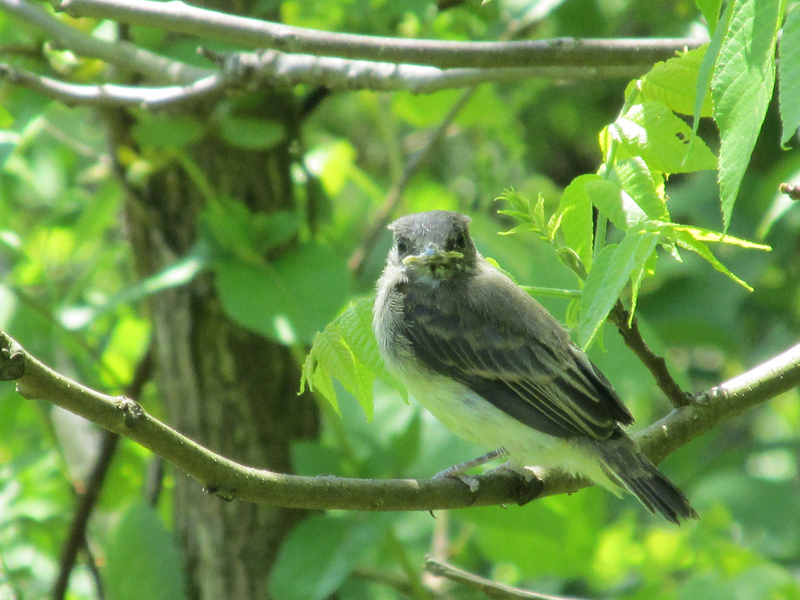 Eastern Wood-pewee, 12; Acadian Flycatcher, 26; Alder Flycatcher, 3; Least Flycatcher, 2; Eastern Phoebe, 26; Great Crested Flycatcher, 1; and Eastern Kingbird, 15. White-eyed Vireo, 3; Yellow-throated Vireo, 2; Blue-headed Vireo, 36; Warbling Vireo, 1; and Red-eyed Vireo, 137. Blue Jay, 56; American Crow, 153; Common Raven, 15; Northern Rough-winged Swallow, 29; Purple Martin, 20; Tree Swallow, 58; Barn Swallow, 46; and Cliff Swallow, 317. 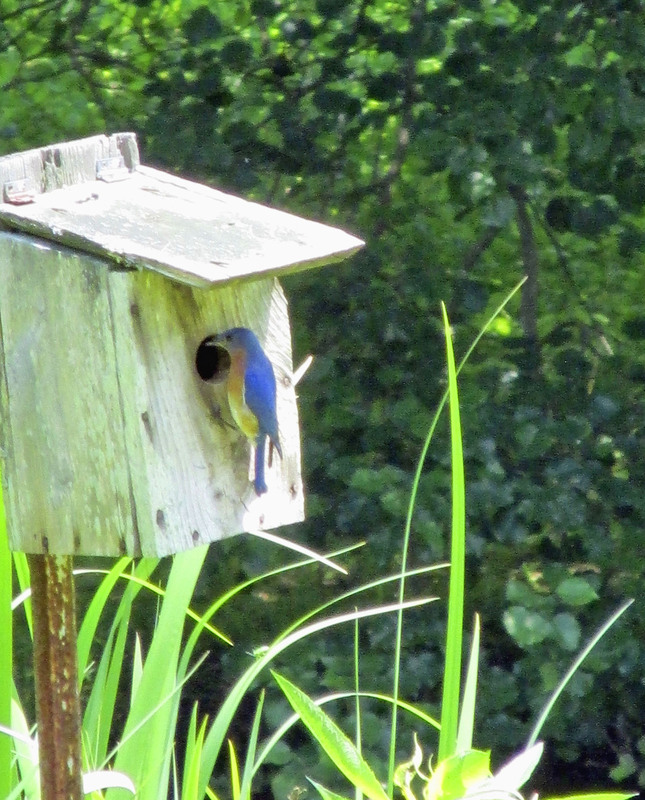 Eastern Bluebird peeks into the interior of a bird box. Carolina Chickadee, 49; Tufted Titmouse, 52; Red-breasted Nuthatch, 10; White-breasted Nuthatch, 16; Brown Creeper, 3; House Wren, 36; Winter Wren, 9; and Carolina Wren, 66. Blue-gray Gnatcatcher, 34; Golden-crowned Kinglet, 7; Eastern Bluebird, 24; Veery, 33; Hermit Thrush, 4; Wood Thrush, 40; American Robin, 350; Gray Catbird, 34; Northern Mockingbird, 30; Brown Thrasher, 13; European Starling, 180; and Cedar Waxwing, 57. Ovenbird, 49; Worm-eating Warbler, 6; Louisiana Waterthrush, 10; Golden-winged Warbler, 4; Black-and-white Warbler, 23; Swainson’s Warbler, 3; Kentucky Warbler, 1; Common Yellowthroat, 27; Hooded Warbler, 84; American Redstart, 9; Northern Parula, 14; Magnolia Warbler, 2; Blackburnian Warbler, 1; Yellow Warbler, 7; Chestnut-sided Warbler, 29; Black-throated Blue Warbler, 43; Pine Warbler, 5; Yellow-throated Warbler, 8; Black-throated Green Warbler, 31; Canada Warbler, 27; and Yellow-breasted Chat, 5. 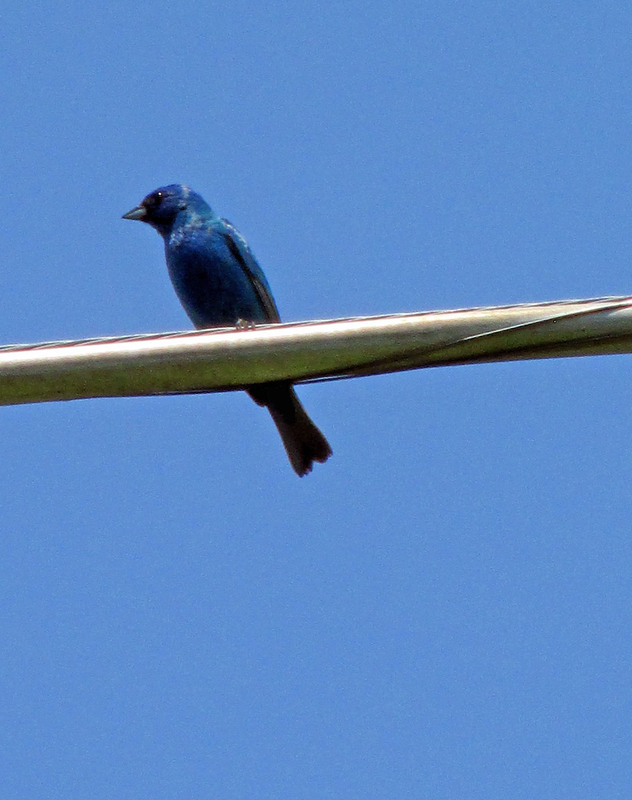 Indigo Buntings were common birds on both of the summer counts. 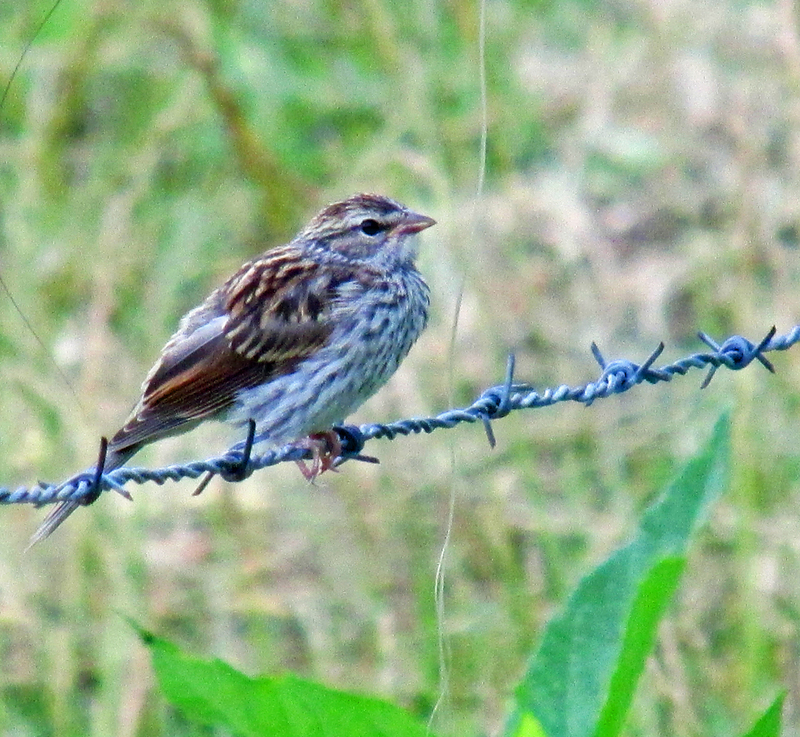 Eastern Towhee, 99; Chipping Sparrow, 53; Field Sparrow, 38; Vesper Sparrow, 2; Song Sparrow, 159; Dark-eyed Junco, 47; Scarlet Tanager, 26; Northern Cardinal, 89; Rose-breasted Grosbeak, 11; and Indigo Bunting, 183. Red-winged Blackbird, 59; Eastern Meadowlark, 18; Common Grackle, 149; Brown-headed Cowbird, 76; Orchard Oriole, 3; and Baltimore Oriole, 1. House Finch, 24; American Goldfinch, 72; and House Sparrow, 49. 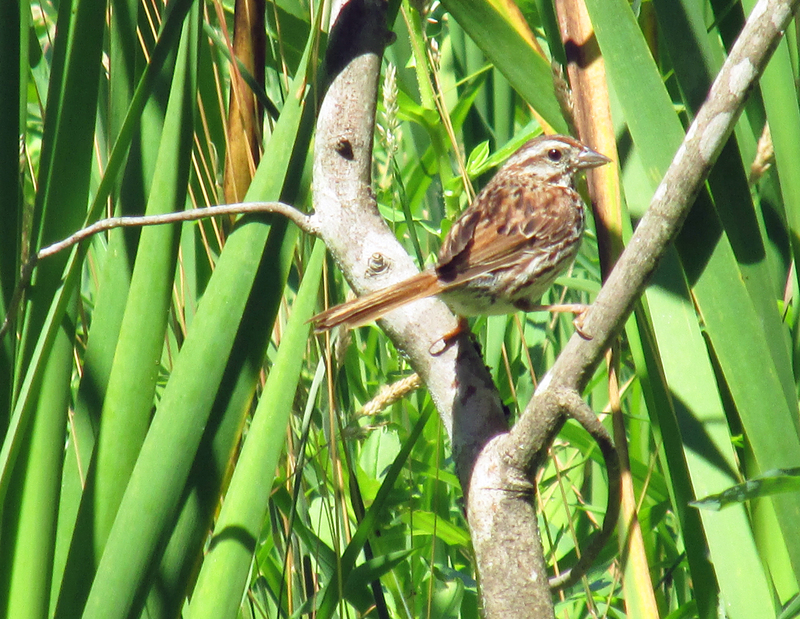 Last year the chapter began a new summer count to gather data on an under-birded area. The second annual Unicoi County summer count was held Saturday, June 6, with 15 observers in five parties. Participants found 110 species, down one from last year’s total of 111. 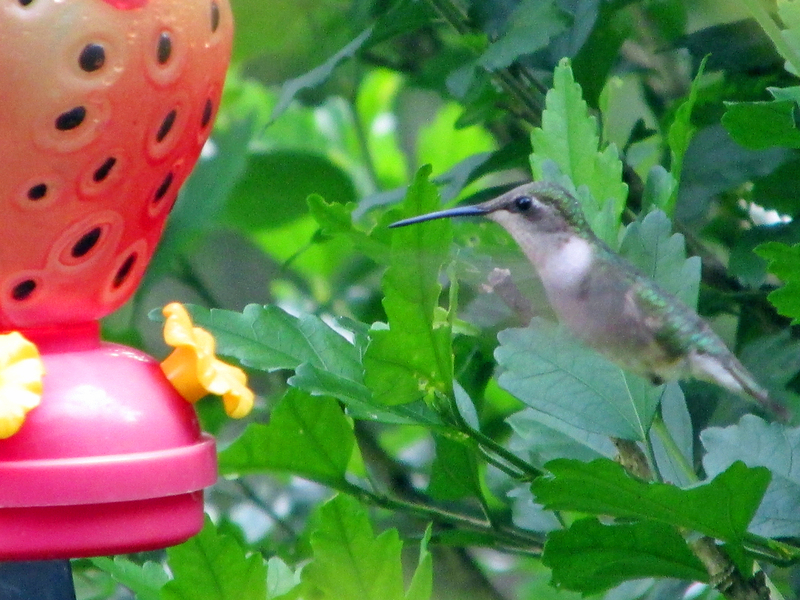 Ruby-throated Hummingbird visits a feeder. Highlights included a lingering Ring-necked Duck, two Ruffed Ruffed Grouse, a Bald Eagle, a Yellow-bellied Sapsucker and 10 Least Flycatchers. Other noteworthy birds included two Warbling Vireos, three Common Ravens, six Red-breasted Nuthatches, three Winter Wrens, five Golden-crowned Kinglets, and two Hermit Thrushes. In additional, a total of 21 species of warblers were found, including two Golden-winged Warblers, three Swainson’s Warbler and eight Magnolia Warblers. Other highlights included 15 Red Crossbills and a single Pine Siskin. Canada Goose, 66; Wood Duck, 37; Mallard, 48; Ring-necked Duck, 1; Ruffed Grouse, 2; Wild Turkey, 33; Great Blue Heron, 4; and Green Heron, 3. Black Vulture, 4; Turkey Vulture, 24; Bald Eagle, 1; Sharp-shinned Hawk, 1; Broad-winged Hawk, 7; Red-tailed Hawk, 7; and American Kestrel, 2. 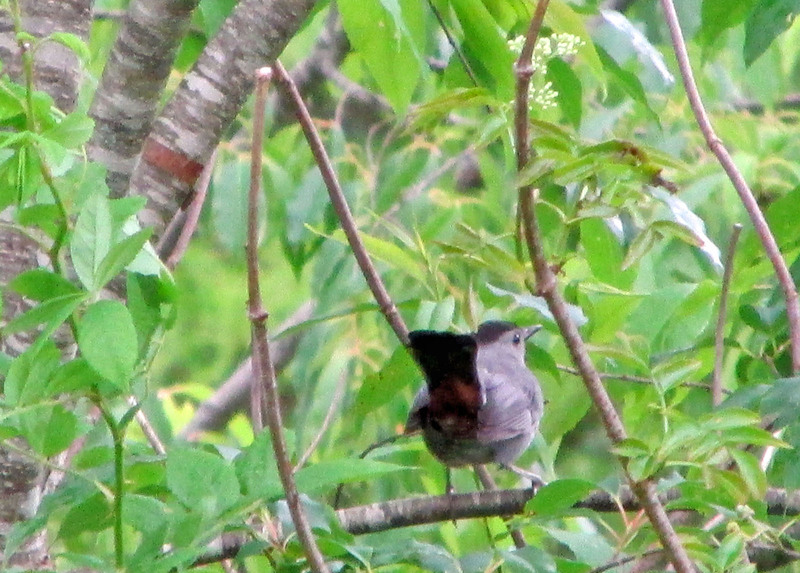 A Gray Catbird retreats into a tangle of vegetation. Killdeer, 11; Rock Pigeon, 78; Mourning Dove, 105; Eastern Screech Owl, 5; Great Horned Owl, 1; and Barred Owl, 3. Chuck-will’s-widow, 4; Whip-poor-will, 5; Chimney Swift, 46; Ruby-throated Hummingbird, 11; Belted Kingfisher, 3; Red-bellied Woodpecker, 11; Yellow-bellied Sapsucker, 1; Downy Woodpecker, 20; Hairy Woodpecker, 5; Northern Flicker, 7; and Pileated Woodpecker, 16. Eastern Wood-pewee, 16; Acadian Flycatcher, 38, Least Flycatcher, 10; Eastern Phoebe, 40; Great Crested Flycatcher, 1; and Eastern Kingbird, 15. 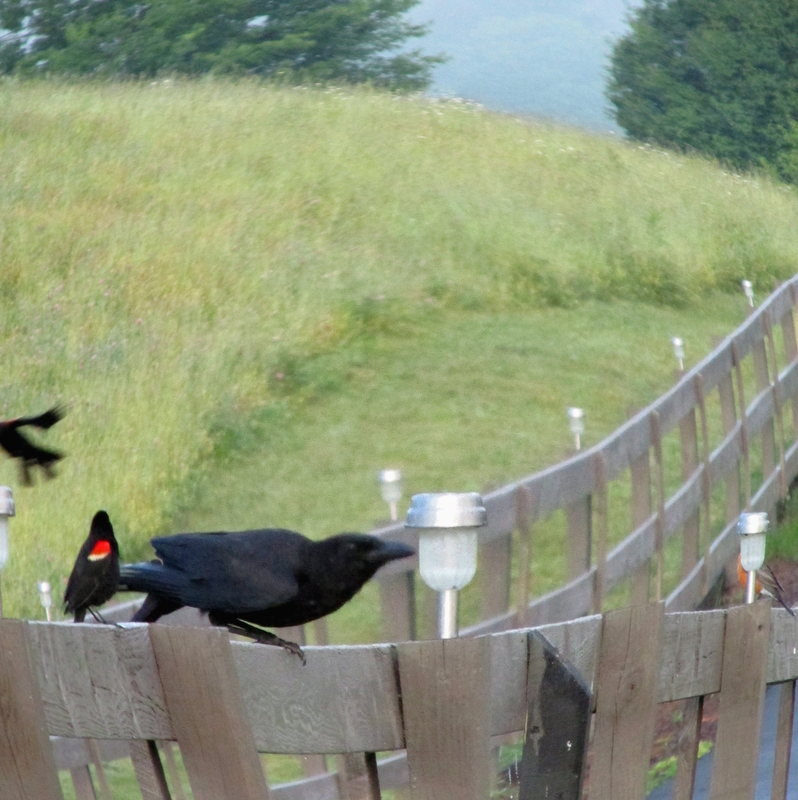 Red-winged Blackbirds mob an American Crow during the Unicoi Summer Bird Count. Yellow-throated Vireo, 3; Blue-headed Vireo, 19; Warbling Vireo, 2; and Red-eyed Vireo, 153. 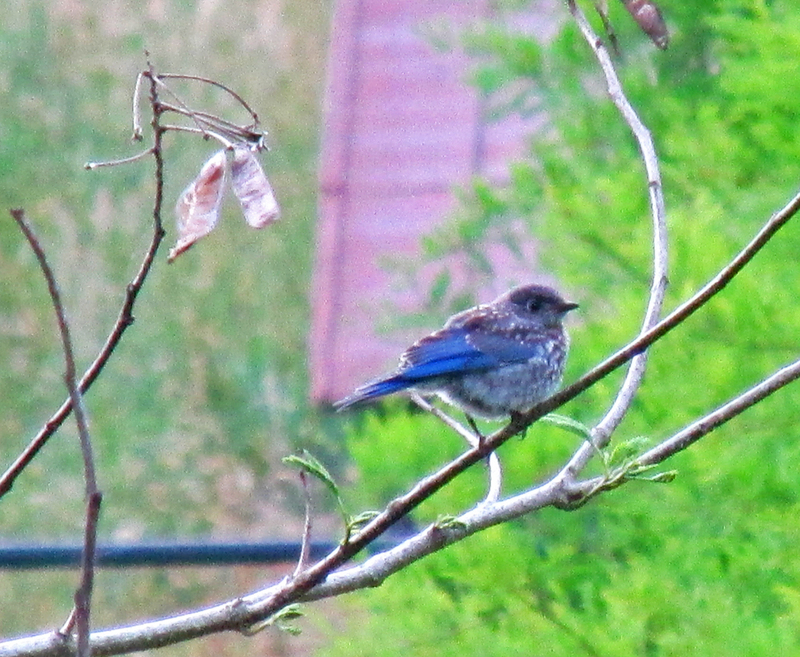 Blue Jay, 55; American Crow, 141; Common Raven, 3; Northern Rough-winged Swallow, 27; Purple Martin, 15; Tree Swallow, 71; Barn Swallow, 77; and Cliff Swallow, 32. Carolina Chickadee, 55; Tufted Titmouse, 68, Red-breasted Nuthatch, 6; White-breasted Nuthatch, 12; Carolina Wren, 43; House Wren, 29; and Winter Wren, 3. Blue-gray Gnatcatcher, 28; Golden-crowned Kinglet, 5; Eastern Bluebird, 57; Veery, 26; Hermit Thrush, 2; Wood Thrush, 37; American Robin, 296; Gray Catbird, 27; Northern Mockingbird, 16; Brown Thrasher, 13; European Starling, 371; and Cedar Waxwing, 66. 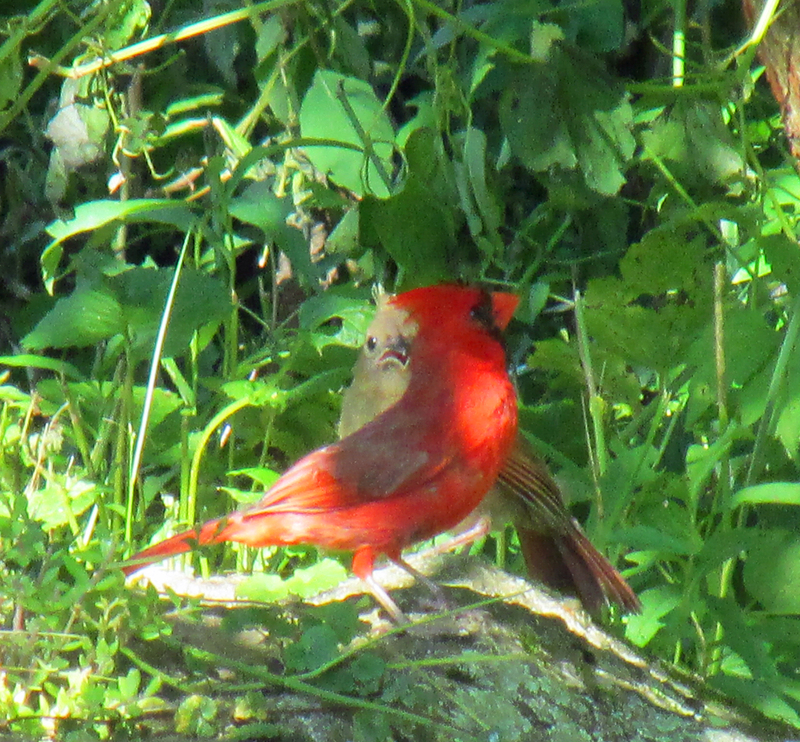 Ovenbird, 67; Worm-eating Warbler, 9; Louisiana Waterthrush, 7; Golden-winged Warbler, 2; Black-and-white Warbler, 19; Swainson’s Warbler, 3; Kentucky Warbler, 2; Common Yellowthroat, 3; Hooded Warbler, 74; American Redstart, 10; Northern Parula, 15; Magnolia Warbler, 8; Blackburnian Warbler, 3; Yellow Warbler, 3; Chestnut-sided Warbler, 19; Black-throated Blue Warbler, 21; Yellow-throated Warbler, 8; Prairie Warbler, 5; Black-throated Green Warbler, 37; Canada Warbler, 17; and Yellow-breasted Chat, 6. 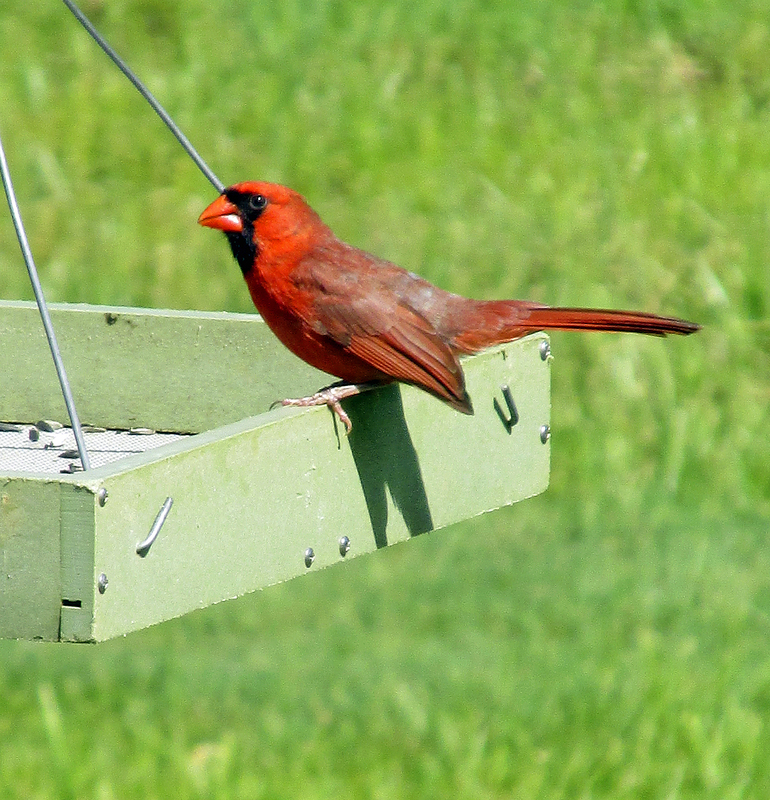 Northern Cardinal visits a feeder for sunflower seeds. Eastern Towhee, 85; Chipping Sparrow, 39; Field Sparrow, 7; Song Sparrow, 152; Dark-eyed Junco, 39; Scarlet Tanager, 31; Northern Cardinal, 78; Rose-breasted Grosbeak, 5; and Indigo Bunting, 152. Red-winged Blackbird, 47; Eastern Meadowlark, 9; Common Grackle, 92; Brown-headed Cowbird, 20; Orchard Oriole, 4; and Baltimore Oriole, 1. House Finch, 17; Red Crossbill, 15; Pine Siskin, 1; American Goldfinch, 96; and House Sparrow, 27. Participants (on one or both counts) included Jim Anderson, Rob Armistead, Rob Biller, Monica Black, Rick Blanton, Jay and Deb Campbell, Ron Carrico, Glen Eller, Harry Lee Farthing, Jacki Hinshaw, Rick Knight, Richard Lewis, Joe McGuiness, Tom and Cathy McNeil, Charles Moore, Brookie and Jean Potter, Peter Range, Bryan Stevens, Peggy Stevens, Kim Stroud and Mary Anna Wheat. In addition, an incidental observation was received from Adam Campbell. 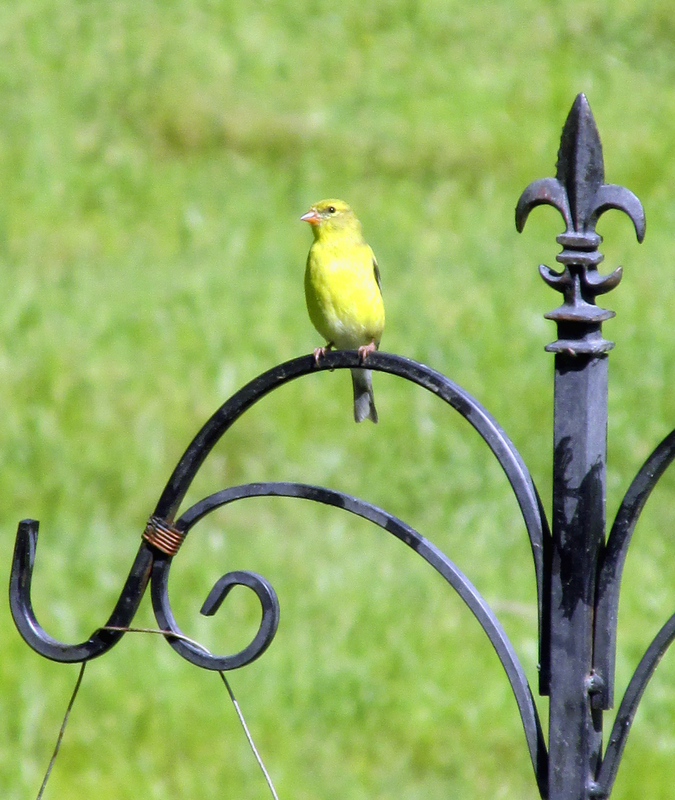 An American Goldfinch perched near a feeder. 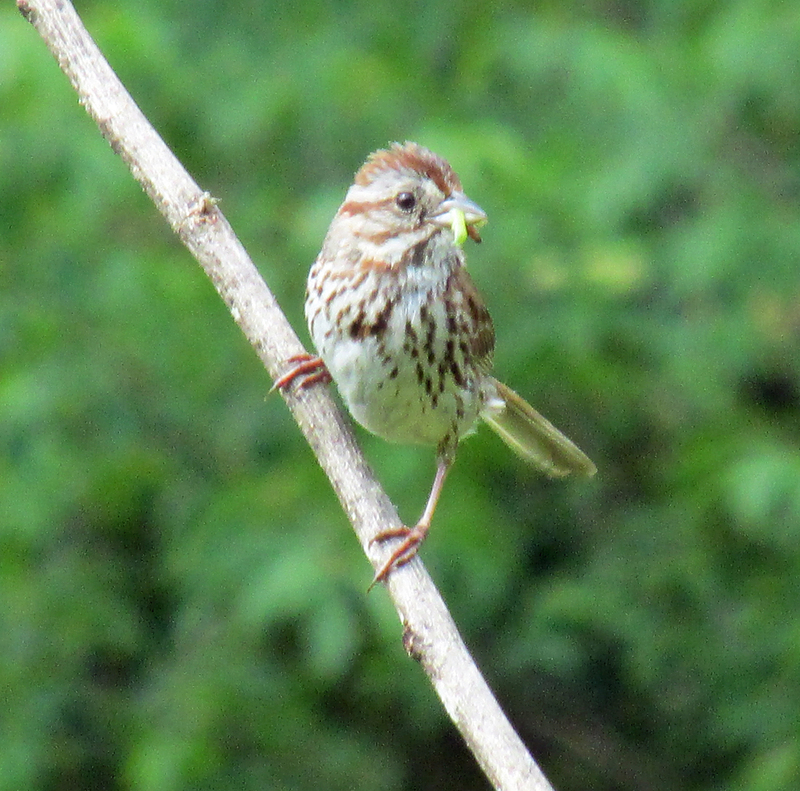 This entry was posted in Birding, Birds, Summer Bird Counts and tagged Birding, birds, Bristol Herald Courier, Bryan Stevens, Carter County Compass, Elizabethton Star, Erwin Record, Feathered Friends, McDowell News, Our Fine Feathered Friends on June 21, 2015 by Bryan Stevens.